Fretz high-quality precision riveting hammer. The finest-quality jeweler's hammers around. 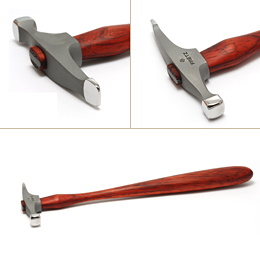 Like a work of art in itself, each precision-milled head is set on a fine Padauk handle. We love these tools and hope you will, too. Great hammer! I look forward to getting more Fretz hammers! My 1st Fretz hammer and he is fantastic! I look forward to adding to my collection also.